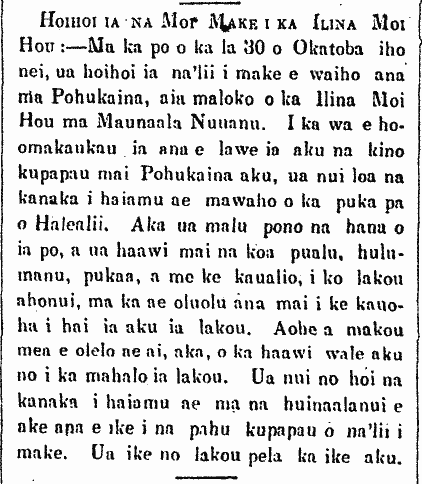 The Alii moved to Maunaala, 1865. The Deceased Kings Taken to the New Royal Cemetery:—On this past 30th of October, the deceased alii who were at placed at Pohukaina were taken to the New Royal Cemetery at Maunaala, Nuuanu. When they were preparing to take the remains from Pohukaina, there were many people gathered outside the gates of the Palace grounds. But the activities that night were properly peaceful, and the volunteer [pualu], hulumanu, cannon, and calvary troops extended their patience. We have nothing to say but to give our thanks to them. There were many people gathered at the street crossings in hopes of seeing the coffins of the deceased alii. They knew that is how they would see them. Ka Nupepa Kuokoa, Buke IV, Helu 44, Aoao 2. Novemaba 4, 1865.